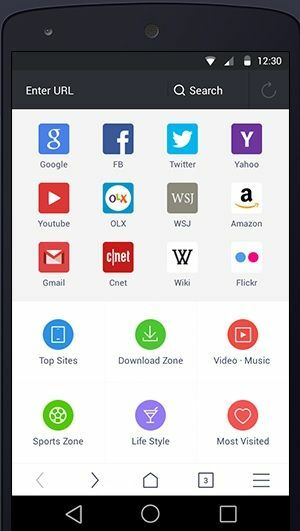 Free download UC Browser for android latest version with APK file. It is very common to use and very famous browser for Android. It is developed by UC Mobile. There are many other browsers for Android phone, but UC Browser is the one browser who is most using browser right now. If you didn’t use it till now, check it out. Some critics criticized that this browser looks like 90’s browser. Web pages are viewed as those were seen in decades back. Some of video formats couldn’t be seen on this browser but, apart from this it has some extra and nice features which cover its drawback. It has better Homepage than other browsers, you can add more websites on your Homepage which you like and visit the most. You can surf the internet with the help of site navigation page. It has a new feature which is really new for mobile browser that it can auto reconnect for download if it a download is failed due to poor network connection, UC browser will resume the download automatically. It consumes less memory usage now, while opening many tabs at a time. UC Browser has some extra features too, like it has ‘quick access links’ where you can select your best and most visited website. It has a number of tab management options. It has a clear and nice window browser function; besides this function it has a lot of other options as well when go to the Menu.